The Black Beauty Zucchini always give us a bumper crop. When harvesting for our table or market, we try to pick them young, when they are no more than 6″ – 8″. Once in awhile we miss one. This is one we let go a few days longer than we like. We just overlooked it. They can get much larger than this very easily. 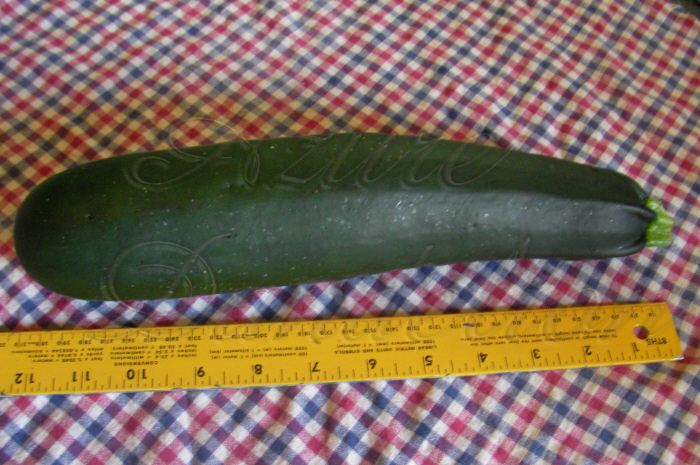 We have had them reach more than 2 feet long, looking more like a watermelon than a squash. Amazingly the flavor and texture remain pretty good, until they get, huge. The only downfall to letting them get big is more work in having to remove the seed are before cooking. Of course if you are saving your seeds back you will want to let a few get large.